This lighthouse was rendered obsolete when the new Viareggio lighthouse was built along the shore. Viareggio is the most important bathing resort on the Tuscan coast with a 10 km. long beach and over 100 bathing establishments, offering visitors a wide choice for relaxation and entertainment. The town - home of Lorenzo Viani, the composer Giacomo Puccini and the writer Mario Tobino - is surrounded by the hillside, the Apuan Alps and the lake of Massaciuccoli; it provides a unique ensemble featuring pinewoods, a colourful harbour, shipyards and a 3 km- long promenade with superb shops, cinemas and a theatre; here the Carnival of Viareggio the most famous in Italy. Until the nineteenth century Viareggio was a small seaman's and fisherman's village. It was born astride the Burlamacca Canal, which runs from the inland area directly to the sea and divides the whole area into two parts with its docks and the port which today enjoys a great deal of commercial, industrial, and tourist activity. The walk along the jetty is especially beautiful. It runs alongside the Burlamacca Canal and extends out into the open sea for almost a kilometer. The city has two pinewoods. One is located in the urban center and is known by the name of Pineta di Ponente. It has all the characteristics of a public park. The other is called Pineta di Levante. It begins at the docks and extends for 6 kilometers as far as Torre del Lago. It is still in its natural state with luxuriant vegetation and thick undergrowth. The Viale dei Tigli, a magnificent panoramic avenue, crosses it in its entire length. Viareggio is the capital of the Italian Carnival. The Viareggio Carnival had its beginning at the end of the eneteenth century. lt is now a unique tradition, with its mesked procession that witness the parade of giant paper-marchè. These directions are to the new Viareggio lighthouse. It's possible they will take you past the old lighthouse as well. Take the exit for A11 and get on A11 heading west. In about 1km take the exit for SS1 south. In appx. 3km take the exit for Via dei Pioppi. Take a left at the end of the ramp. At the interesection with Via di Montramito take a right. In about 3km you'll get into the heart of Viareggio and what appears to be a pretty complex intersection. What you'll want to do here is take a left onto Via Circonvallazione. In about 300m take a left onto Via Nazionale Aurelia Sud. 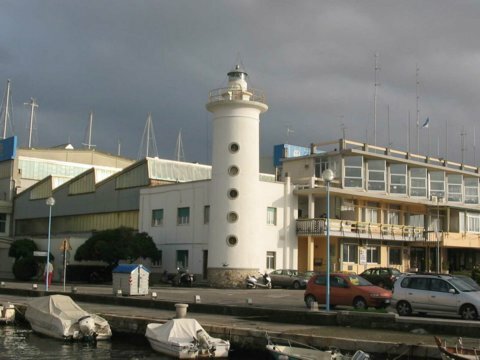 In 1km turn left which will take you out to the Porto di Viareggio lighthouse.